The Global Mentorship Network is a collaboration between the International House and the Office of International Affairs that aims to develop and facilitate a network of support for international graduate students at the University of Chicago through regular meet-ups and social events. This one-year program will connect mentors with a cohort of new international graduate students. With support from I-House and OIA, mentors will foster a sense of community and provide resources for their cohorts. 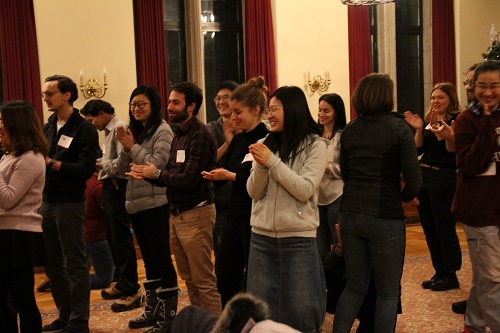 Through this collaborative cohort model, inclusive programming, and regular reflection and feedback, the Global Mentorship Network intends to enhance the overall international student experience at the University of Chicago. Participants in the GMN Network for the 2018-2019 academic year can now join our new facebook page. We will be using this page to share announcements (which we will also continue to share through our email lists and I-House posters) and to facilitate discussion between our members. Students from the Global Mentorship Network participated in an improv theater workshop with the Revival Theater last fall.